One of the many perks about being on a social buying mailing list like Groupon and Twangoo is the endless restaurant deals, often at more than 50% off their normal price. At times I do wonder how these merchants make money, but I guess whatever possible losses they make from group buying ventures are consider customer acquisition cost; their objective is to get first time customers through the door. Eh, where was I? I digressed. I blame that on job hazards. And so I bought this super deal from Cubix restaurant from Groupon a few weeks ago, and managed to use the voucher last week. Cubix is located at The Fleming Hotel, located along Fleming Road at Wan Chai. The hotel is surprisingly not easy to find; it is best you have the full address and Google map with you. The entrance to Cubix is also somewhat confusing. There is no direct entry from the hotel lobby. You need to get out of the hotel, down a side corridor to a wooden door that looked just like a wall. The restaurant itself is small, and most of the available table has a full view of the kitchen door, which kept opening and closing during my visit. That was surprising because there were only two occupied tables at that time of the night, and a little more than annoying. But the food, thankfully, more than made up to it. The salad was surprisingly well done. Served with Parma ham, the lettuce was crisp, the dressing just nice, the bread crouton crunchy to the bite. 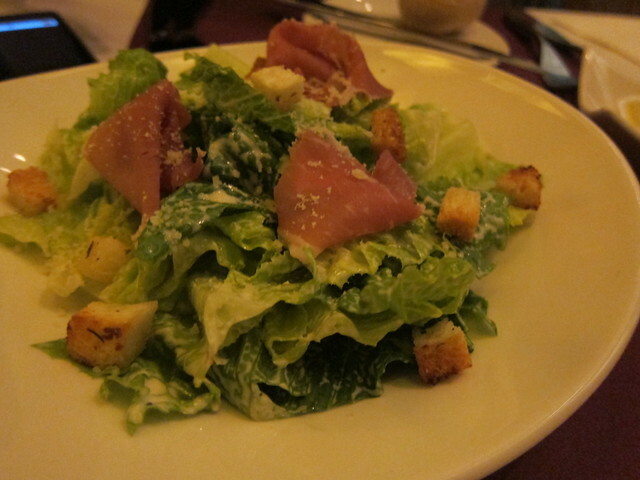 I am not fan of Caesar salad but this is recommended.